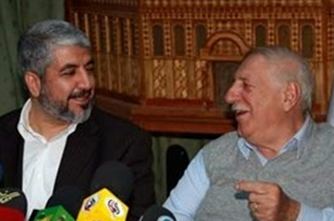 Several Israeli media outlets accused Hamas leader in exile, Khalid Mashal, of pressuring Hamas leaders in Gaza to have further confrontations and clashes with Israel along the borders of the Gaza Strip.The media outlets, including Yedioth Aharonoth, based their analysis on Mashal’s recent speech in which he said that all options are open and that the resistance will counter any Israeli aggression. They stated that Mashal is threatening to escalate the situation with Israel, and is pushing Hamas leaders in Gaza to confront the Israeli military while they are interested in calm and in easing this tension. The latest analysis comes while Iran’s presidents threatened Israel “of death” should it decide to attack Gaza again. On Saturday, Mashal said that all options are open, and that the Palestinian armed groups will practice their right to resist the Israeli occupation. His statements came during a meeting with a number of off-shoot Palestinian factions based in Syria. Meanwhile, Ahmad Jibril, Secretary-General of the Popular Front for the Liberation of Palestine – General Command, said that the Palestinians will not abandon their right to resistance and armed struggle against the occupation. He added that the Palestinian factions will not accept the conditions of the Quartet Committee, and will never recognize Israel. The statements of Mashal and Jibril came during a brief press conference in Damascus. The two leaders said that the outcome of the Arab Summit in Libya is very disappointing. They called on the Arab and Muslim nations to unite and counter the Israeli aggression in Jerusalem and in Gaza. Israel said that Hamas fighters in Gaza are trying to prevent other fighters from firing homemade shells into adjacent Israeli areas, and are interested in truce.